I picked up a copy The Penny Magazine of the Society for the Diffusion of Useful Knowledge. I got it at Renninger’s, the Kutztown Farmer’s Market. 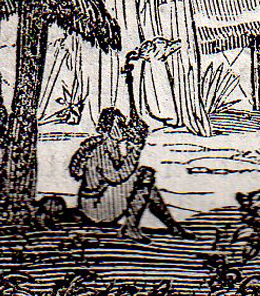 This magazine was published in 1834. It cost me one dollar. Consulting an online Historical UK Price Convertor reveals one British 1834 penny is today worth nearly .97 pound sterling, or about $1.51 U.S.. Wow! I saved 50% I’m not an antique collector. 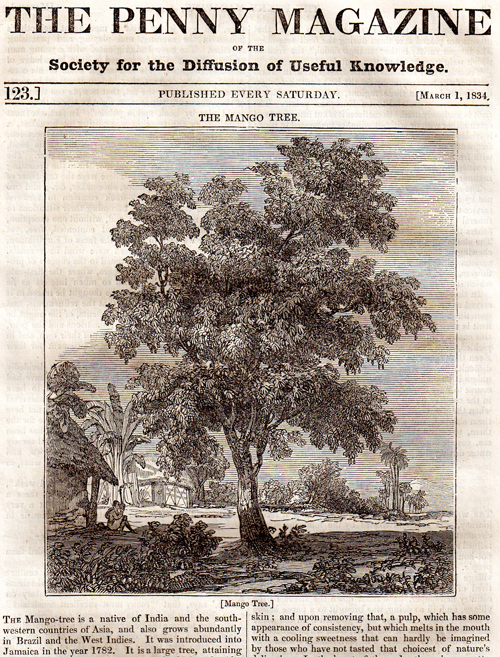 I actually started to reading the cover story about mangoes and found it fascinating. The little magazine is just eight pages. There is a review of a concert at an inn in Sussex, that concedes “England is now not a musical country.” Next comes the magazine’s longest article on the history of the East India Tea Company. 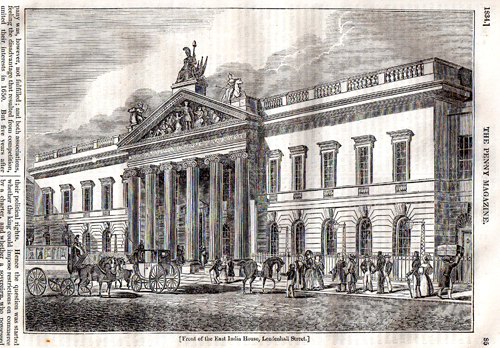 It is illustrated with an engraving of the company’s London headquarters, so large that one has to turn the magazine sideways to see it. 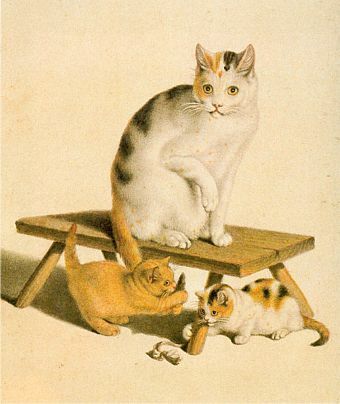 There is a fascinating story about “The Cat Painter,” Gottfried Mind, born in Switzerland in 1768. The critic tells us Mind’s “drawings of cats were so admirable as to entitle him to the honourable, but rather awkward title, of The Raphael of Cats.” Unfortunately, this one story is not illustrated. I never heard of him, did you? I found an illustration of Herr Mind’s art at Wikipedia. One of the scholarly references cited is an 1887 article by Franz Wiedemann: Der Katzenraphael. Art by Gottfried Mind, "the Raphael of Cats," courtesy Wikemedia. There is one more illustration on the last page of the Penny Magazine that I must share, below. 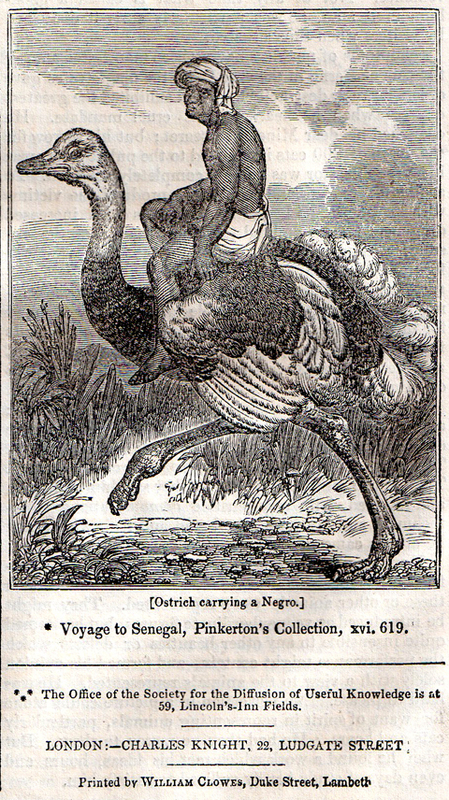 This sort of image reminds us that England not only gave us the Encylopedia Brittanica, but she also gave birth to Monty Python’s Flying Circus! Speaking of WIKIPEDIA: I would be lost without Wikipedia. Not only did Wikipedia help me investigate the Raphael of Cats, but it came in handy many times when I was putting together Powerpoint lectures for my History of Graphic Design class. I just made a tiny painless Paypal donation to Wikipedia. Happy Holidays, Wikipedia! You make me happy! The Diffusion of Useful Knowledge goes digital! Next > Jeff Smith and Jeffrey Smith are both great illustrators. As to the artist Mind, I MAY be wrong, but if he’s the same fellow, there was a wonderful painter of cats at that time that went quite mad and was institutionalized. They allowed him paints and his work evolved into an AMAZING level of surreality. Always cats, but good grief, how they changed! I saw the work in a long ago article. He’d been quite successful and I don’t recall what drove him over the edge. Does anyone know for certain of whom I am thinking? I’d like to look him up.